Combining magical illusions and classic tales for a truly unique theatrical experience! Each show features a beautiful backdrop, turning your home or party space into a professional children’s theater, with colorful costumes and the levitation of a child in mid-air! Don’t see your theme below? Never fear. Contact me and let’s talk about how we can create something truly special for your child! Enhance your party with Face Painting, Balloon Sculpting and Magic Party Favors! 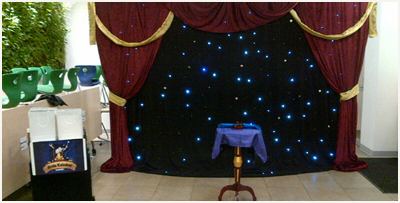 Arnie’s flexible backdrop turns your home or party space into a professional children’s theater. Tables, bottles, and wands appear, disappear, and float in the air in this interactive, funny show! From a magical picture that comes to life and speaks to the children, the birthday child and friends help me perform all the magic – even learning to read my mind! As a finale, the birthday child is levitated in mid-air! Custom tailored for ages 3 and up. Magic seems to have gone missing in Arendelle! But never fear, Elsa has come to the rescue. My lovely “assistant” Crystal plays Elsa in full costume and teaches us her special magic while being extremely careful. As Elsa tries to drink a glass of water, it visibly turns to ice! In fact, everything starts to freeze! Together, we find that the ultimate magic lies in the love the birthday child has for his/her friends, which saves the day! Elsa sings “Let it Go” in her Broadway-caliber voice as we float the birthday child in mid-air! 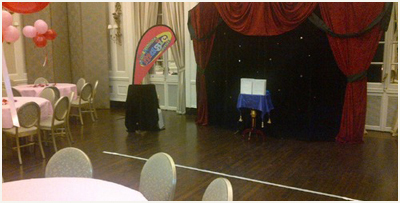 It’s a fun-filled themed magic show for all ages. Playing Peter and a hilarious Captain Hook while my assistant Crystal plays Wendy, we also cast the birthday child as Little Peter or Little Wendy. Peter takes the children on a magical journey to Never Land where ordinary objects appear, disappear, and levitate. Captain Hook tries to perform Peter’s magic but the children outsmart him at every turn. The kids learn to fly with Peter and, of course, clap for Tinkerbell! A life-size crocodile puppet adds to the fun and laughter of this unique experience. As the magical Prince, the funny Stepmother and Lord Boxington (the Royal Magician), I enlist the birthday girl/boy as the Fairy Godmother who helps create all the magic with her trusty wand. Crystal plays a charming Cinderella who magically transforms from rags to riches! Funny and engaging – you’ll love this twist on the classic tale! As the Prince, the funny Witch and a comical dwarf (with shoes on his knees), Crystal as Snow White, the birthday child as Little Snow White, and six other children playing the other dwarfs, this is sure to be a memorable experience for everyone! As the children try to warn Snow White not to eat the apple the Queen magically creates, they learn the importance of following directions and the consequences of talking to strangers. Sing-a-long songs include “Hi Ho!” and “Whistle While You Work.” A magical kiss wakes Snow White and the love of all her friends causes the birthday girl to float in mid-air! As the Wizard, Scarecrow and funny Witch, and Crystal as Dorothy, we enlist the birthday child as Little Dorothy, Little Scarecrow, Tin Man, or Lion. Children play the Munchkins, Glinda, and the Winged Monkey. With an authentic backdrop and familiar songs, parents tell us this one brings a tear to their eyes. Transport your party into Hogwarts! Professors Dumbledore, Snape, and Trelawney lead an interactive, fun-filled “Wizarding Class” at Hogwarts. The children help the great wizards make objects appear, disappear, and transfigure. During the show, the talking Sorting Hat magically “sorts” everyone into the 4 houses. The birthday child can play either Harry or Hermione. Enhance your party with our amazing balloon hat sculptors who can create anything from Quidditch brooms to Dementors after the show!